With the private sector, exchanges are mostly inclined to benefit all parties. While contemplating issues academically and analytically, one can easily get lost in the abstractions of statistical numbers and jargon, and end up with a misleading or incomplete understanding of the subject. In the field of economics, for instance, one can get a different perception when abstract terms like "the economy" or "the market" are used to describe people engaging in exchanges of time, labor, and resources than would arise if one were to address people's activities directly. Of course, addressing the "economy" or the "market" as an aggregate makes it sound homogeneous, which, though it definitely tends to be dynamic, doesn't give the full picture. From one's perspective of "the market" as a single entity, one must carefully de-abstractify it and dissect it into subcategories to get a better understanding of how it really works. The distinction between the private and the public sector is the most important one to understand the market, in my opinion, and I will therefore attempt here to analyze and illustrate how they differ from a theoretical viewpoint. What fundamentally distinguishes the two sectors? The layman may just consider both of them important and mutual parts of the economy, while many activists and economists want one or the other to dominate. If one of them is to dominate, it is crucial to get the analysis right when it comes to how they differ. To do this, I'll analyze how the two different sectors get the money to start their operations and maintain them, as well as how they determine what and how much to produce. Let's start with the source of revenue of the different sectors. Many of those who favor the public sector tend to favor programs such as "free" healthcare, education, housing, Universal Basic Income (see: free money), etc., provided by the State. But are they really free, and if so, in what sense? In the private sector, most goods and services tend to be set with a given price that the customer is expected to hand over if they want to acquire it. Such a clear price tag isn't presented with public sector goods and services that are presented as "free." They may be free in the sense that the customer who wants the good or service doesn't need to sacrifice any of his own money to attain it during the time of the transfer, but how can it be so when it surely can't have appeared straight out of a vacuum? It isn't a mystery where the money comes from—taxes—though this is seemingly mystified among those who favor such "free" programs. Services provided by the State are not necessarily wanted by those who pay for them, like bombing children in Yemen. But this term in itself has been even more significantly mystified. For what are taxes? Taxes are the money handed over to State officials among citizens who either do so because of habit and because everybody else does it or because of the threat of coercion if one doesn't do so. It's important to note here the distinction that services provided by the state are not necessarily wanted by those who pay for them (like bombing children in Yemen), in comparison to the private sector, where you usually know exactly how much you have to offer to get a good or service in return and can engage in the voluntary transaction if you find it beneficial. So what has the State done to "deserve" its revenues? Though most people find at least some of the State's services desirable, its programs can only be established after the money is collected, and one can therefore not reliably know immediately the degree to which the money from a new tax will be used on what is promised. To better illustrate, if the same were the case with a private company, it would be like taking money from all its customers, putting it all together in a bag, and then taking a handful of the money and using it for purposes the managers decide before the customer potentially gets something back that, only if he's lucky, could be something he wants or maybe even what he himself ordered. It's true, in a democratic system, politicians can be less inclined to impose taxes lest they risk not getting reelected, but that's pretty much their only limitation besides their conscience. Election campaigns are the political version of a commercial break where they advertise for their own suggestions of services to be established through the social apparatus of compulsion and coercion, where the demand of the majority opinion determines the winner. Before we move on, it's worthwhile to take a deeper look into how the system of democracy, which is widely accepted as the best political system, affects the distinction between the private and public sector. Skeptics of democracy from the anti-State perspective have claimed “there are those that work for a living and then there are those that vote for a living” (often attributed to H.L. Mencken without citations, so a more reliable source to quote is James Bovard's "Politicians are dividing Americans into two classes—those who work for a living and those who vote for a living."). Under a democratic system, what goods and services will be produced—and how much of them—are determined by the officials that the majority voted for. This illustrates how the system can tend to lead to the winners (majority) living at the expense of the losers (minority) in the election. 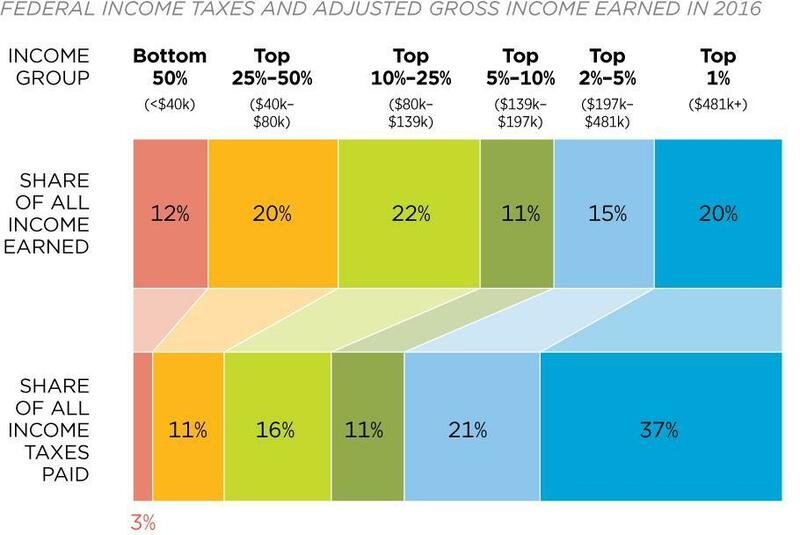 This is clearly seen in the tax-to-transfers ratio in the different income quintiles in the United States. The Congressional Budget Office reported that in 2014, the three lowest quintiles received more transfers than they paid in taxes, meaning that the poorest three-fifths of the population lived to some degree at the expense of the richest two-fifths of the population. Another indicator that the US has, to some extent, become a country where those who vote for a living live at the expense of those who work for a living is that the top 1 percent of the income distribution earned 20 percent of the total share of income while paying 37 percent of the income taxes in 2016. As this analysis concerns the differences between the public and private sector, rather than the costs and benefits of having a democratic system, what may be perceived as a downside here will not be weighed up against the upsides of the system. What's clear here, however, is that under a democratic system, what goods and services will be produced—and how much of them—are determined by the officials that the majority voted for and that that can lead to the majority living at the expense of the minority. If the private sector operates without much State involvement, then what customers consider unethical behavior will rather tend to get punished. Looking back at the private sector, how is it here determined what goods and services should be produced and how much? In short: the profit motive. I have elaborated on how this works in my book review of Ludwig von Mises's Profit and Loss, but to put it shortly, entrepreneurs will make what they think will result in profits. Those who condemn the system of profits and losses and the profit motive that drives it, claim that this can—or even tend to—lead to unethical behavior to get as much profit as possible. But, is this really true for the private sector? The truth is that it depends, for how is profit attained here? If the private sector operates ceteris paribus without much State involvement, then what customers consider unethical behavior will rather tend to get punished, while good behavior will tend to be encouraged in order to make the businesses get a better image among their customers so they won't go over to their competitors (more on this here). It's a relatively common misconception that profit is derived from negative activities such as businesses exploiting their workers, but its origin may lie in the fact that in a private sector with State involvement (often called corporatism or crony capitalism), businesses will attempt to acquire special favors and subsidies, which helps them attain a source of revenue and privileges that can significantly decrease the incentive for the privileged businesses to act honorably. It may even be the case that businesses with special State favors and subsidies will earn more money by acting with high-risk and more unethical behavior. It's important to note here that this is not the default position of the private sector; it is the case only when the State involves itself in it. Those who strive to improve matters in the public sector tend to be more eager in funneling tax money into the endeavor at hand, rather than using current funding more efficiently. With the public sector, however, this is the default position. Politicians and bureaucrats decide where the tax money of the populous will go, and once a State program is established, it can be difficult to make big changes on it, even if it turns out to have major errors (like the British National Health Service) lest the politicians lose support. Unlike the business leaders in the private sector, those in control of the public sector only need to concern themselves with striving for cheaper and higher quality goods and services insofar that it will increase their chances of getting reelected or establishing a better legacy for themselves. And those who actually do strive to improve matters in the public sector tend to be more eager in funneling tax money into the endeavor at hand, rather than using current funding more efficiently. Not to mention, they usually attempt to increase some tax in the private sector to fund such further expenses. However, the State still doesn't really know what or how much ought to be produced to get the most desirable output. Economist Ludwig von Mises is particularly known for his formulation of the so-called "economic calculation problem," which he discussed in the 1920s. This problem essentially says there are five criteria that must be met for successful economic calculation and that the free market (where the private sector dominates) meets these criteria, while the socialist State (where the public sector dominates) doesn't. Mises even claimed that this means "rational economic activity is impossible in a socialist commonwealth," and that they thereby cannot reliably know where capital and labor should be allocated to get the most desired outcome. (For more details on the five criteria and how the two sectors differ there, see my post "Mises’ Economic Calculation Problem: The Answer to ‘Is it possible to have an economic system with no money?’”). We are now in a position to answer more fully the question: what is the State? The State, in the words of Oppenheimer, is the “organization of the political means”; it is the systematization of the predatory process over a given territory. For crime, at best, is sporadic and uncertain; the parasitism is ephemeral, and the coercive, parasitic lifeline may be cut off at any time by the resistance of the victims. The State provides a legal, orderly, systematic channel for the predation of private property; it renders certain, secure, and relatively “peaceful” the lifeline of the parasitic caste in society. Since production must always precede predation, the free market is anterior to the State. The State has never been created by a “social contract”; it has always been born in conquest and exploitation. As Frédéric Bastiat said, "The State is the great fictitious entity by which everyone lives at the expense of everyone else." In other words, the lifeblood of the public sector is the exploitation of the private sector, while the private sector is based on voluntary and peaceful exchanges. If one here determines the latter to outdo the former, I think one ought to strive to make the private sector as big a portion of the market as possible through favoring and advocating privatization of current State-owned companies. On the other hand, nationalization, the antithesis of privatization, goes on a road to serfdom towards more coercion, more exploitation, and less freedom. As the great French economist, Frédéric Bastiat said, "The State is the great fictitious entity by which everyone lives at the expense of everyone else." With the private sector, however, exchanges are mostly inclined to benefit all parties. This article was reprinted with permission from the author's blog. Stefan M. Kløvning is a Norwegian high school student studying economics in his spare time, with aspirations of eventually taking a PhD in economics and afterward contributing to growth in the private sector.